"I know God loves me but does he like me? Can I really trust Him with my life? Are my prayers not answered because I don't have enough faith? Maybe these problems I'm having are because God hasn't really forgiven me x2026;" These questions and more constantly plague our minds and weaken our faith in God. 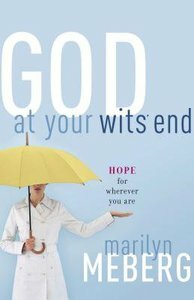 ^In God at Your Wit's End author and counselor Marilyn Meberg probes the corners of our mind to uncover the faulty thinking that leads to an uncertain faith. She then explains how God affirms and even welcomes our humanity in the midst of our brokenness. As she continually points us to the awesome power of God's majestic truth, she helps us reshape our thinking as we re-establish the foundations of our belief in a loving God. ^Complete with thoughtful applications and probing questions, each chapter is designed for either group or personal study and in-depth reflection. About "God At Your Wits' End"